On June 30, 1908 a bolide streaked across the sky in the region near the Podkamennaya Tunguska River in Russia. When it exploded, the airburst leveled more than 2,000 square kilometers of trees. It is now known as the Tunguska event. This particular region of Russia is extremely remote so the damage was limited to trees and other local flora and fauna. But the impact is estimated to have been on the order of 10 -15 megatons. If it had occurred over a major city, the bolide would have destroyed it as surely as dropping a modern nuclear weapon. A similar sized event occurred in Arizona 40,000 years ago, and produced a crater a kilometer wide. Meteor impacts are known to occur from time to time on Earth, such as the Chelyabinsk meteor 0f 2013, but impacts the size of Tunguska are fortunately quite rare. It’s estimated that events of that scale only occur about once every 300 years. So imagine if such an event occurred every 5 years or so. 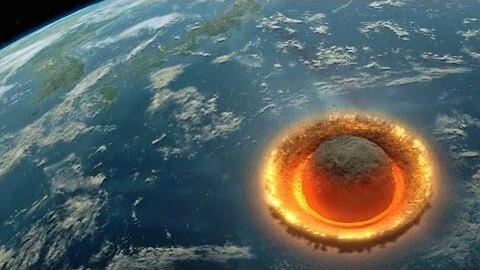 Every few years, and some part of the planet gets a crater, or an airburst. Most would be in remote areas, but some wouldn’t. Of course we know that meteors follow a power law distribution in size distribution. So for every Tunguska event, there would be thousands of Chelyabinsks. So perhaps 200 of them every year. Then there are the larger ones. Big impacts creating 10km-wide craters every century or so. And the ever larger ones every millennia. Now imagine Earth gets pummeled at this rate for 200 million years. Such a thing likely occurred on Earth about 4 billion years ago. It is a period known as the Late Heavy Bombardment (LHB). It is also known as the lunar cataclysm, because the first evidence of the LHB was found on the Moon. When the Apollo astronauts brought back lunar rock samples, it was found that they all showed evidence of impact melts around this period. This would imply that the Moon must have been heavily bombarded during that time. If the LHB model is correct, then a similar bombardment should have occurred on Earth and other inner planets. But at the time there was no evidence for it. Then in 2002, isotopic measurements of rocks in Greenland and Canada showed signs of a similar impact period. There have been several models proposed to account for this bombardment period, but one is that of planetary migration in the early solar system. One model, known as the Nice (pronounced neese) model, posits that Jupiter was roughly at its current distance when it entered a 1:2 resonance with Saturn. The resulting resonance drove Neptune (initially closer than Uranus) to the outer edge of the solar system, pushed Uranus and Saturn outward, and scattered much of the remaining protoplanetary material. Some of it was flung inward, creating the LHB period, while some was flung to the farthest reaches of the solar system, forming the Oort cloud. While the LHB is the most popular explanation for the lunar rocks, there are some who disagree and have proposed alternate models. We can’t be certain yet that such a heavy bombardment period actually happened. But it certainly seems that Earth’s early period was quite tumultuous.